First stepping into a go-kart at age four, the young Dan Wheldon grew up with a steering wheel on his hand. When he reached 21 years of age, Wheldon entered the United States marching through the open wheel racing ladder. Coming to the country operating at square one, the young Brit quickly established himself netting titles in US F2000 in 1999, Toyota Atlantic in 2000 and the 2001 Indy Lights championship. Debuting in the INDYCAR Series with Panther Racing for two races in 2002, Andretti-Green Racing (becoming Andretti Autosport in 2010) picked up the British expatriate to drive for their team in 2003. Winning Rookie of the year in that first full year of INDYCAR competition, Wheldon's career was taken to the next level with a victory at the Twin-Ring Motegi oval in 2004 followed later by wins at Nazareth and Richmond International Raceway. Perhaps what cause be considered Dan Wheldon's dream season, the 2005 INDYCAR Season saw him in victory lane 5 times including the Indianapolis 500. Going on the win the series championship by 80 points over Tony Kanaan, Wheldon reached the big time. For 2006, Wheldon signed with Target Chip Ganassi Racing. From 2004 to 2008, Dan Wheldon's INDYCAR Career was electric with 15 wins in 97 races as he drove for both Andretti-Green Racing and later for Target Chip Ganassi Racing. Along the latter part of this path, he formed a partnership off the track marrying his wife Susie in 2008. One year later, the couple welcomed their first child Sebastian. For two seasons, Dan Wheldon raced rejoined Panther Racing. While Wheldon's time in the Panther Racing team's #4 car did not net the victorious success as compiled with Andretti-Green or Target Chip Ganassi Racing, the 2009 and 2010 campaigns together resulted in 3 runner-up positions. Two of the three 2nd place finishes in the highly competitive series were at the Indianapolis 500. Finishing 9th in the 2010 IZOD INDYCAR Series overall points, the Wheldon/Panther Racing partnership disbanded after the 2010 season. Despite his youth and history of winning ways, Dan Wheldon sat out the start of the 2011 IZOD INDYCAR Series. Instead, the Brit's focus was off-track as difficult news forged with fortune early in the year. The most unfortunate news was that Wheldon's mother was diagnosed with Alzheimer's disease during the off-time from the IZOD INDYCAR Series. However, a medical information regarding his mother also involved some more positive family news. In March of this year, his wife Susie gave birth to the couple's second son Oliver. Out of the ride for the 2011 season, a one-off deal was forged with the #98 Bryan Herta Autosport/Sam Schmidt Motorsport car. Qualifying in 6th place, Dan Wheldon did not show any rust as his lapped the track in an average speed of 226.490 miles per hour through 4 laps. While not the fastest car, Dan Wheldon and the #98 team moved up steadily through the final 10 laps. Saving fuel early, Wheldon was able to push for 2nd place through the final lap behind JR Hildebrand. On the fourth turn of the final lap, Hildebrand (driving for Dan Wheldon's former team of Panther Racing) ran wide and slammed into the outer wall. Wheldon in the last few hundred yards, sailed across the start/finish line winning the Indianapolis 500 in spectacular fashion. Wheldon's second win at the Brickyard, this latest victory was sweetened by the presence of his wife and children. A most popular win at the 100th year of the Indy 500, the Dan Wheldon win served as a favourite underdog story in modern open wheel racing. 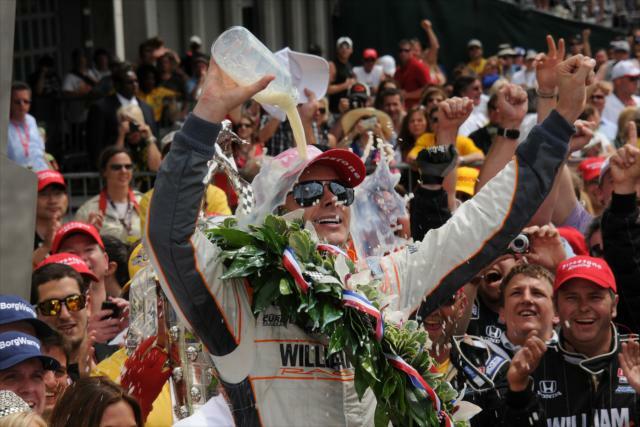 Starting the year on the sidelines, Dan Wheldon was suddenly an in demand personality in motorsports. One of the IZOD INDYCAR Series television broadcasters Versus called upon the recent Indy 500 winner as a colour analyst for several events providing some fresh, relevant insight to races including the Texas Motor Speedway double race. Wheldon's skills were also welcomed by Dallara and the IZOD INDYCAR Series as test driver for the new 2012 Indy car. Putting the new spec car through its paces at Mid-Ohio and most recently the Indianapolis Motor Speedway, Wheldon was highly favoured to be racing this new vehicle next season. In September, INDYCAR and website hosting company GoDaddy.com got together with Dan Wheldon to present a promotion at the season finale race at Las Vegas Motor Speedway. If Wheldon would have been able to win the IZOD INDYCAR World Championship event at Las Vegas, him, his team and a fan would split a 5-million dollar bonus. In a press conference for announcing the GoDaddy INDYCAR Challenge, Wheldon stated, "I am really excited to return in the #98 entry with SSM and BHA to follow-up our success at this year's Indy 500 and go after another race win, especially with this carrot on the end of the stick," Taking over the #77 car for Sam Schmidt Motorsports, Wheldon was granted a warm-up race at Kentucky finishing 14th on the day. While winning the Las Vegas race would have probably been a bigger long shot than his Indy 500 win, Dan Wheldon was just happy to be back in a race car. "I'm ready for the Go Daddy INDYCAR Challenge and, hopefully, myself and one lucky fan will be smiling on October 16." said Wheldon in September. On lap 12 of the IZOD INDYCAR World Championship at Las Vegas Motor Speedway, the two-time Indy 500 winning driver Dan Wheldon would be 1 of 15 drivers caught up in what was probably the worst crash in INDYCAR history. Occuring as cars were travelling at 200-plus miles per hour, the impact was so hard for many drivers including Will Power, JR Hildebrand and EJ Viso. In the wreckage, Wheldon's #77 car became the concern as safety officials placed a yellow tarp over the badly torn apart Dallara chassis. Confirmed reports that the Brit was being rushed to hospital via helicopter led many to fear something bad was transpiring on what was a quiet race track. Sitting in silence, the entire Las Vegas Motor Speedway was awaiting word for the auto racing great praying for the best news. Unfortunately, a press announcement from INDYCAR's CEO Randy Bernard delivered somber news of the loss of Dan Wheldon to "unsurvivable injuries". As his fellow drivers and everyone else affiliated with the race series were understandably in tears over the passing, drivers and the IZOD INDYCAR Series got together for an immediate tribute. Running in a three-wide formation for five laps, the remaining race cars were steered around the 1.5 mile Las Vegas Motor Speedway. Dedicated to the memory of Dan Wheldon, those final laps at least gave teams and race fans a closing race moment following the disturbing crash scene. 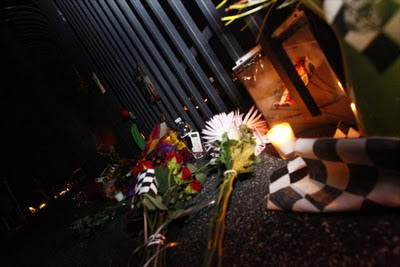 On Sunday night as night set on the Indianapolis Motor Speedway, a memorial was created on the gates of the track where Dan Wheldon and the #98 Bryan Herta Autosport performed the masterful upset less than five months earlier. Candles were lit, flowers and race memorabilia would soon rest in a sizable shrine after only hours of the 33-year old driver's departure from Earth. More tributes are definitely in the immediate future including the suspension of the IZOD INDYCAR Las Vegas post-race celebrations in memory of Wheldon. For teams and race fans alike, we bid our deepest condolences to the young racer's family, wife and 2 young children. Attracting a media presence that often ignores auto racing, this is ultimately not the way a driver wants to be remembered.﻿﻿ While the mainstream public shares the condolences only realizing Dan Wheldon through the Las Vegas crash video and some dry statistics. Once hearing of his death, some will question why people would risk their lives in this competition at speed. While life is full of risks, race car drivers are individuals who live life coming the realize a challenge is not always to back away from through existence. Of course, the life of Dan Wheldon, or the many other auto racers who died in the pursuit for performance greatness, would have been much more appreciated on world for much longer but when they lived their lives inside and around race cars it might be hard for drivers to experience life at all without this particular fulfillment. The privileged people who got to know Dan Wheldon personally through life, their pleasure of knowing the great racing driver brings the deepest sadness. As a community, we support and remember Dan Wheldon for sharing a piece of his 33 great years with a world.